Swedish folk Viking metal band Feskarn from Uppsala has just released its second full-length album “Östra Aros” via the German label Pesttanz Klangschmiede. Formed in 2010 by Niklas Larsson, the sole member of the band, Feskarn released its debut album “Raise Your Swords” in 2012. The new album contains songs more aggressive than before, still with epic Viking melodies. Slower parts with pure viking singing, combined with growls and better mouth-harp sounds. 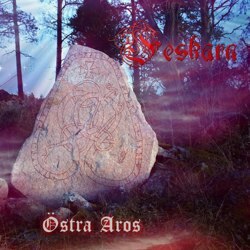 “Östra Aros” contains 12 songs plus a bonus-track and its lyrical concept is about Vikings, battles and drinks. The album is officially released on February 1st 2014.